See the 2018 Dryland Forest Symposium Presentations here. Click here for 2019 Symposium Info. 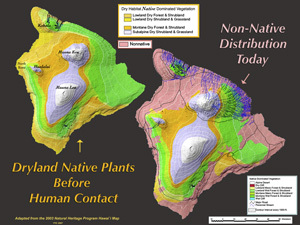 Only 5% to 10% of dry forests remain in Hawaii as illustrated by the ecosystem map. Less than 3% are considered healthy. More than 25% of Hawai`i endangered plant species are found in dry forests. The dry forests of Hawai‘i are one of the rarest and most beautiful habitats in the world, and are home to many threatened and endangered plants, birds and insects. Diverse dry forests once thrived in many low rainfall areas of Hawai‘i Island, such as the leeward side, and played a vital role in the life of the Hawaiian people. Just 100 years ago, broad expanses of healthy forest stretched across the landscape of Hawai‘i. Due primarily to anthropogenic (human) impacts, only a small number of scattered dry forest remnants survive today, reminding us of the highly diverse community of plants and animals that once dominated these lands. Dry forests are located at a wide range of elevations. High elevation māmane forests host rare native plants and birds unique to the upper reaches of the high mountains, yet many dry forest plants can thrive on the coastal strand as well. Low elevation slopes also have unique dry adapted plant communities, such as the ancient lama forests of North and South Kona. Unfortunately, experts estimate that only 5% to 10% of dry forests in Hawai‘i and worldwide now remain. Once common native trees have undergone an astounding decline in their populations. Because dry forest ecosystems are so rare, all dryland habitat species are at risk, whether federally listed or not. There is little funding but a growing number of people are volunteering their time and expertise to these rare dry forest communities. Where there is responsibility, care, and effort there is hope. Ka‘ahahui ‘o Ka Nāhelehele’s mission is to advocate for the perpetuation of Hawaii’s dry forest ecosystems, and the many often endangered plants, birds and insects that live within these communities. This is done through partnerships, and programs with both youth and adults about the importance of dry forests. Nāhelehele believes integrating education, cultural programs, indigenous knowledge and science builds healthier connections between Hawaii’s people and the native dry forest. The organization is also actively involved in a variety of hands-on projects such as ongoing dry forest and nene sanctuary restoration at the Pu’u Wa’awa’a Forest Reserve, establishing dry forest corridors to connect dry forest remnants, providing continuing dry forest education through the annual Nāhelehele Dryland Forest Symposium and this educational website, and providing dry forest plant species conservation through the Hawaii Island Seed Bank.